Copyright © 2006 Michele Cameron Drew. All Rights Reserved. Interesting thought George. Noone has ever described my work that way. I am well known for my vivid colors, but also my textures. 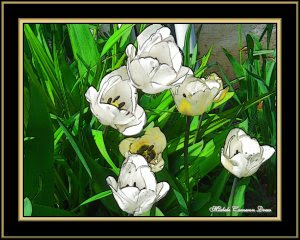 When these images are seen in their largest versions or have been printed, whether giclee` canvas or photo print there is there is a great amount of detail that is not available in a smaller version. This is so simple and beautiful, a 'pure' looking piece.